I stumbled on something fun. Roasted legumes are nothing new, the roasted chickpeas in Mediterranean markets are common although I find them chalky and unpleasant. I roasted some cannellini and limas in the past (the limas are only fair). 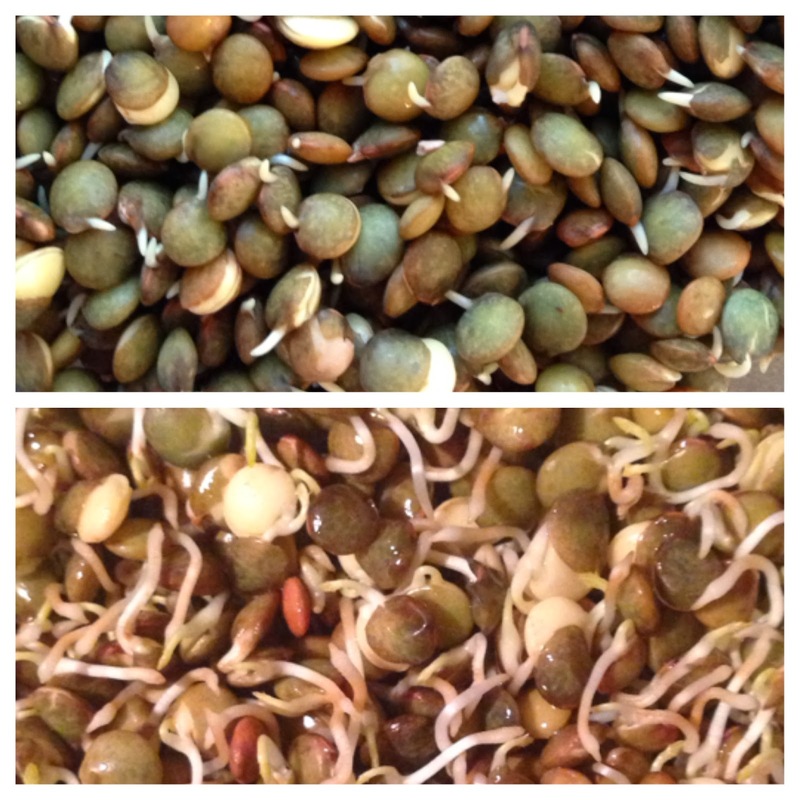 In this version, I try lentils and take the pre-processing a step further, sprouting prior to roasting. I've been making sprouted french lentils in hopes of putting them into a bhelpuri. Once I had the sprouts in hand, I couldn't resist giving the tiny lentil a light low temp roast. French lentils were soaked for 4-8 hours, the water drained and the moist lentils allowed to sit a few days loosely covered. Here's the sprouting after a day and after about 3 days. click on this image, the big version is awesome! Then I salted the moist lentil sprouts and tossed them in a roasting pan with a spritz of canola spray to roast at 300F until the sprouts shriveled and started to look like spiders. Given their diminutive size, I bet they burn fast. I didn't time the roasting, but it was only about 20-30 minutes. After cooling, they're crunchy and tasty, not chalky and gooood. Enjoy.